The next step in the Note family? The phablet is here to stay and the Note 3 is the best out there - fast, powerful and supremely functional. 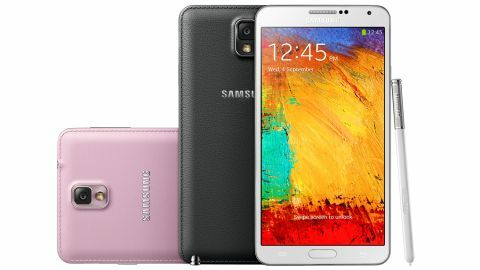 The Samsung Galaxy Note 3 is looking to continue in the same vein as the original Galaxy Note and Galaxy Note 2, offering you a phone which could almost be mistaken for a tablet and wants you to believe it's both. Let's get one thing straight before we dive into this review though, the Galaxy Note 3 is only going to appeal to a narrow segment of users, it's certainly not going to have the broad appeal of the Galaxy S4, nor catch the eye of the fashion-conscious iPhone 5S purchaser. The Note 3 isn't pretending to be anything it's not. It knows it's a big, some may say huge, smartphone and Samsung understands that form factor won't be for everyone. That said, with big size comes big price, and the Galaxy Note 3 will set you back a wallet-busting £600 (around $950, AU$1,000) SIM-free. The hefty price tag can be softened if you choose to pick the Note 3 up on a two year contract, but you'll still be paying a relatively high amount a month for the privilege - upwards of £35 per month in the UK if you want a free phone. In terms of competition there's not a great deal which compares to the Samsung Galaxy Note 3, but its closest competitor is currently the Sony Xperia Z Ultra which boasts a massive 6.4-inch which dwarfs even this handset. A quick glance over the Galaxy Note 3 and it does exactly what we thought it would do: takes over the mantle as the world's most powerful smartphone, although the advantage is a lot smaller this time. First up we have to mention the display - it's grown again since the 5.5-inch offering on the Note 2 to a palm busting 5.7 inches complete with a full HD, 1080 x 1920 Super AMOLED display. That's the same resolution as the Galaxy S4, but as the screen is larger on the Galaxy Note 3 the pixel count isn't as great at 386ppi, so it's not quite as pin sharp as its smaller brother. It still looks pretty impressive though - and so it should for the price Samsung is asking. We're still waiting for Samsung to embrace the full metal chassis we've enjoyed on the HTC One and the iPhone 5, but it is trying something slightly different with the Note 3. The Galaxy Note 3 has retained the metal frame from the Galaxy S4 running around the edge of the device providing a rigid body and a more premium look, but it's on the rear where Samsung has tried something new. Lay the Note 3 face down, take a quick glance at the handset and it appears the rear is made of leather. It isn't, of course, it's that famous plastic Samsung is so fond off. The finish is textured to give it the appearance of leather and this actually provides some much needed grip. Those stitches running round the outside of the back cover? Well that's just a pattern formed in the plastic. It may not be everyone's cup of tea and it looks a bit tacky upon closer inspection, but the Note 3 does feel like a solid, well built device. On the plus side the plastic cover can be removed giving you access to the Note 3's sizable 3,200mAh battery as well as the microSD slot which is cleverly stacked on top of the microSIM port - allowing Samsung to save some space. Somehow Samsung has managed to make the Galaxy Note 3 slightly smaller than its predecessor, measuring 151.2 x 79.2 x 8.3 mm. That's still quite a sizable device, but considering it's got a slightly larger display, beefier processor and more powerful 13MP camera it's an impressive feat. Those of you blessed with smaller palms will still struggle to hold the Note 3 in one hand, especially when typing is involved, but thanks to its reduced weight (it's 168g, down from 183g on the Note 2) it's certainly the most manageable Note smartphone to date. The sheer size of the Galaxy Note 3 means you'll be constantly shuffling it up and down your palm as you try and reach the volume rocker and power/lock keys located towards the top on the left and right sides of the handset and the menu keys below the screen. While the buttons are responsive, we found we tended to employ our second hand to help us out when moving from the power/lock key down to the home, menu and back buttons. Under the hood of our review unit sat an insanely powerful 2.3GHz quad-core processor, although a select few markets will be treated to an octa-core option which houses two quad-core chips. You also get 3GB of RAM and the option of 32GB or 64GB of internal storage in the Samsung Galaxy Note 3, while the latest version of Google's operating system - Android 4.3 Jelly Bean - runs merrily on top of all this. From the front you'll note there's a pleasingly slender bezel running down either side of that monster 5.7-inch display, while below you get the customary physical home key flanked by two touch keys - menu on the left and back on the right. You can't see the touch keys when the Note 3 is idle, as their backlights are only displayed when you unlock the handset or tap the area they're located in. They are incredibly responsive though, and you don't have to worry about getting your finger right on the logo, the area of recognition is wide enough to pick up even the most misguided stabs. Apart from the questionable leather-effect rear the Samsung Galaxy Note 3 offers up little in terms of design. Sure it looks a little more premium than the Galaxy Note 2, and it does feel well made - but at the end of the day it's a little uninspiring. Those will petite palms or a penchant for skinny jeans will struggle with the size of the Note 3, but if you've been taken with its predecessors then you'll be happy to hear this is the best looking Note smartphone to date.